Trains shifted through my childhood nights. I’d hear them in the distance approaching across the Whangamarino Swamps, a rumble that gradually increased in volume and strength. They’d roar past in the dark through Te Kauwhata Station, with high-pitched whistle-shriek or the flatter blare of an electric horn, before slowly fading to the south. They provided a timetable for my dreams. The Night Limited would pass swiftly in the midevening, about the time I was sent to bed. Glowing blinds were drawn down in carriages, concealing the passengers and mysteries of sleeping-compartments . Then later in the night, there would be the rattle and clank of slower goods-trains with their tarpaulin-covered wagons or longer closed trucks moving through the midnight, their steel wheels clicking over rail expansion-joints with a drowsy pulse. Many trains were still hauled by black steam-engines then, the J and K series, pistoned and smoky, with their single bright headlight illuminating the rails. Other trains were pulled by the newer boxy Diesels with their grunting whine. Sometimes the trains were loneliness and distance personified, sounding now nearer, now farther, a rumble on the edge of audibility. At other times they were they were comfort and reassurance, offering presence and human agency in the blackness of the country night. But trains weren’t the only thing that came down the line. In 1962, when I was seven, there were prison escapers. It was an era of prison escapes. Young men in New Zealand jails plotted liberty with the help of forged keys. They climbed prison walls on ropes made from sheets. They escaped from guards on trains, jumped to the tracks, and disappeared into the scrub. They went bush with frequency. Their escapes were covered with devoted radio and newspaper attention, peopling more mundane lives with the idea of hunted criminals on the run. The archetypal representative of the prison escapee of that era was George Wilder. 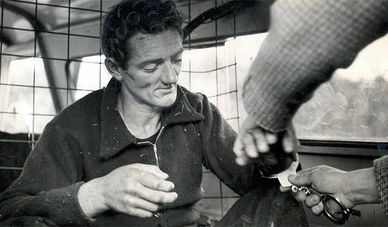 During this first escape, he jumped goods trains, stayed for a time at the Rotorua lakes where he broke into baches to steal clothing and food, was tracked to Waitakares where Police found a make-shift camp in the bush, stole a Vauxhall and fled to Wellington, back to Taumarunui in a Jaguar, Taupo in an Austin A50, before being finally run to ground in Whakamaru. There had been hair-breath escapes, cross-country chases, and day-by-day newspaper reportage. His second escape a year later in 1963, over the blue-stone walls of Mt Eden prison, cemented the legend. It was an era when Police would still set up roadblocks around towns and check cars, but there were always alternative routes. Again Wilder and his companions hit the railway lines and evaded capture. His companions would soon be returned to jail, but Wilder eluded the cordons for 172 days. The newspapers reported trademark thank-you notes when he stole food and the fact that he cleaned-up the baches and huts in which he taken refuge before leaving. His ability to evade police, sometimes by minutes, fascinated the public. Finally, a ranger check of a remote hut, 3 kilometres off the Napier-Taupo Highway at Rangataiki, raised suspicions. When police finally found him, Wilder was in a sleeping bag listening to music on a transistor radio. He’d travelled 2,600 kilometres and committed more than 40 crimes. For me, though, there had been two other escapees with more personal importance. In June 1962, Ian Brown, 21, and Peter Turner, 20, escaped from the Waikeria Youth Centre, outside Te Awamutu. It was the beginning of winter. There was heavy rain. It was cold. They’d gone south at first, to Otorohanga, stealing fresh clothes and abandoning their ex-military prison issue. They also stole a car. Moving north through the rainy Waikato, the car was seen and reported to Police in Huntly. The manhunt found it abandoned a few kilometres north in Ohinewai. My father had a truck-depot and workshop right by the railway tracks in Te Kauwhata. Between sale yards and the Whangamarino swamp on the edge of the town, it was safe from observation. My father also kept the family caravan there. That night the caravan was burgled. Tins of food and two sleeping-bags were stolen. For a seven year old in a small town where nothing ever happened except sale-days, the annual A&P Show, and a circus which sometimes wintered over, this was an event of some significance. I remember imagining the pair crossing the swamps at dawn, wet sky curdling with light to the east, rail freight-cars clanking between the willows and toitoi, and damp red railway signals flaring in the morning mist. Perhaps this is what all these words are really about, two young men on the run along railway tracks in a fitful New Zealand winter morning, imagined by a seven year old. 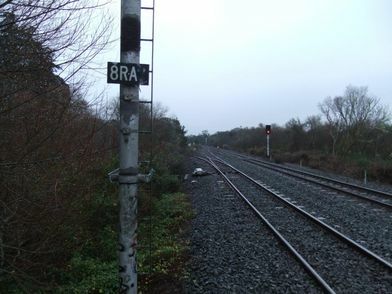 Brown and Turner were tracked from Te Kauwhata, north along the railway, by a dog-handler and a German Shepherd. I can almost hear the dog whining nasally as they crossed single-span railway bridges over dark creeks with the sound of ducks lifting up in alarm from the still pools under the willows. It was a rail repair-crew who finally reported them, two days later, near Mercer. After a brief chase through the paddocks of a near-by farm they were both recaptured. We eventually got the sleeping bags back. Mine had a cigarette burn in the blue-gray cloth outer and somehow that burn-mark was imbued with all the romance of the outlaw, of young men on the run, sleeping criminals, law-breaking, police-chases, and the pure usefulness of homely objects on a rainy night in the swamps which stretched, still undrained, from Huntly to Meremere. All gone now. Different world. Rail was destroyed unjustifiably by New Zealand’s fiscal madness of the 1990s. The long Whangamarino swamp has been partially drained by mercenary agricultural schemes, a bare remnant of its great foggy sprawl. Escapers no longer reach for folk-hero status, having become somehow meaner and less interesting, a pure product of contemporary society, more pathology than myth, more urban than rural. 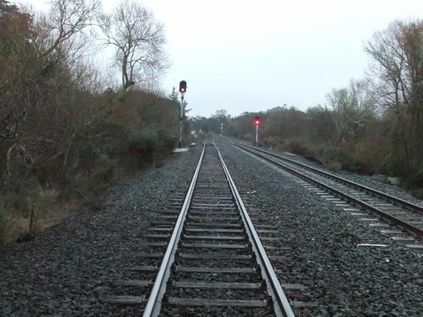 But it is still the railway lines and the journey of hunted men through the gone dawns in the vastness of a misty Waikato swamp that continues to possess me, in a country that has so few real legends. I can recall, in the days before it became a freeway and Mercer became a McDonald's stop, SH1 used to pass by a mysterious house seemingly floating amidst the swamp; like something out of the bayou. What a brilliant piece, David, thank you. When I think of trains, I think of holidaying in a bach in Arthurs Pass, where the road and railway lines to Greymouth nestle in the skinny, shadowed valley between the high peaks. Dark beech forest rises steeply on both sides, and icy streams rush down the mountainsides. Nights are cold, even in summer, and the darkness seems very deep. You can hear kiwi calling in the bush nearby. And, several times during the night, you're woken by the apocalyptic clatter of the heavy coal trains. The coal, dug out of the ground on the West Coast, is carried by train through the Southern Alps, across the Canterbury Plains, past Christchurch, then by tunnel under the Port Hills to Lyttelton, where it's loaded on ships to be sent overseas. This huge journey across the island is necessary because the West Coast has rough seas and no safe ports. The coal trucks, once emptied, are hauled all the way back to Greymouth to begin the journey again. Nice story, David. Until last year, I had not travelled on an NZ train since I was about 3. At that age, my parents put me and my 6 year old brother on a train to Whanganui. My grandmother vividly remembers refusing to allow the train to depart until we were found, asleep somewhere on board. Different times. I think we were put on a domestic flight the next time, no danger of ending up in some random town. This huge journey across the island is necessary because the West Coast has rough seas and no safe ports. The coal trucks, once emptied, are hauled all the way back to Greymouth to begin the journey again. I purely love trains, steam trains (travelled on a lot of those in my childhood) and railcars both. Please please bring back a good train service o powers that be! We stopped by that house once on a family trip and our way down the SH1 shoulder and stepped gingerly onto verge of the swamp, staring a long while past the paint peeling off sagging timbers in the seemingly boundless gloom of drowning willows and ominous crocodilian logs. In my memory there is no traffic (obviously false - 35 years ago it was still a busy highway) and only needs the plaintive clang-clang-clang of an uncontrolled level crossing bell to complete the atmosphere. I hope we celebrated by stopping in Pokeno for a triple scoop icecream by the WWI memorial. Of course the locals probably cheered the departure of ten million mossies and the gain of some hectares of arable land and the quicker shopping trips to the big smokes (anywhere but Mercer counts for this). But that's progress - wonderful when it happens for me but lousy when it happens to things I cherish. I reckon that could make "folklore" grade. As a child I remember George Wilder's fame. There were kids at school who claimed their families left sandwiches out for him on the doorstep. This was an era and place where doors were never locked and the car keys were left in the car. We lived in the country, people would sometimes run out of petrol and Dad would give them a can of farm petrol. Someone once left their watch as security - a few days later the petrol can was back and the watch was gone from the hall table. Great story David, this is full steam ahead into Morrieson territory, lock up your chickens! Magnificent read, David. I've been through that bit of swamp on the Overlander - quite creepy. I really enjoyed reading this piece, David. Lovely prose! Thank you.